Style meets sophistication on this classically designed wedding band. Made of Sterling Silver and plated with Rose Gold, this piece of jewelry features a series of 10 small CZ crystals. 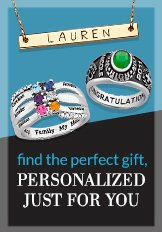 Make this piece of wedding jewelry uniquely hers with a special message. The message will be laser engraved in a special script-styled font.